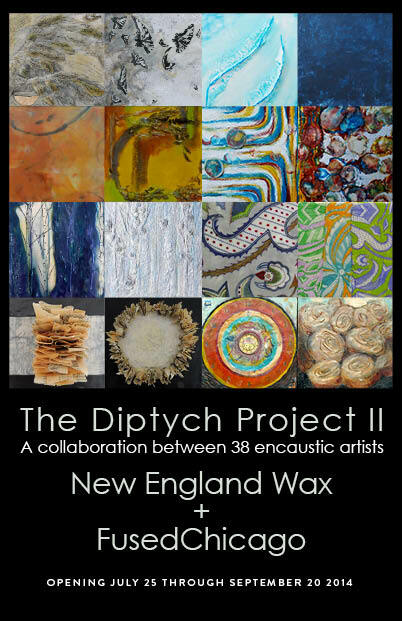 New England Wax, lead by member Dietlind Vander Schaaf, embarked on the second collaborative project of its kind this year. 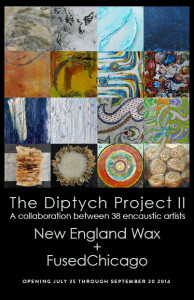 Taking its cue from the first Diptych Project, organized by New England Wax members in 2007, Dietlind identified FusedChicago, a group of artists who work with encaustic paint, and proposed a collaboration. 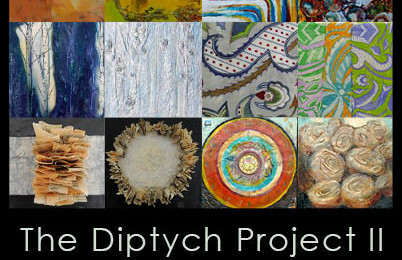 This project was complex and work-intensive, but delivered exciting work and new friendships. Thirty-eight artists from both New England and the Chicago area raised their hands (virtually) to be part of the project and specified their preference for size of work they would like to make. With this information, Dietlind partnered one New England and one Chicago artist to work together. With deadlines set and contact information shared, the artists got to work. Each artist made a piece of work and sent it to their partner. In turn, each artist then created a painting in response to the work they received. The result was an exciting and diverse body of work. 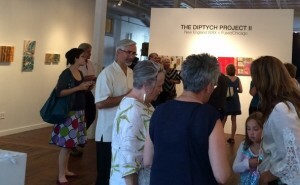 Once the work was complete and photographed, Dietlind compiled an ebook, including all of the work and organized an exhibition at Engine, a non-profit arts center and gallery in Biddeford, ME. 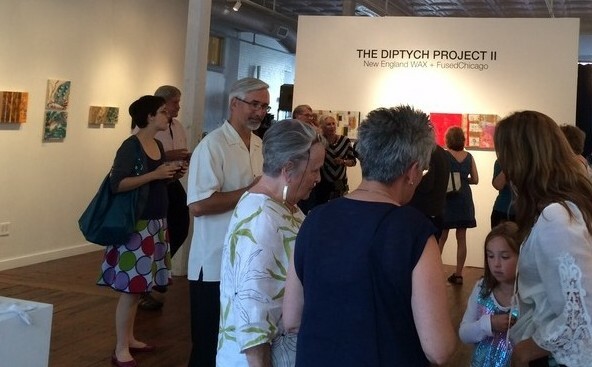 A panel discussion to discuss the collaboration was held at the gallery in August and featured Dietlind, Julie Vohs, Charyl Weissbach, and myself, Catherine Weber. FUSEDChicago has not yet mounted a show of their work but we hope to hear of one soon. An article about the process titled “The Art of Collaboration” will be forthcoming in the winter issue of Encaustic Arts magazine. ← Masks in Wells, Abstraction in Kennebunk!